This page sets out the campaigns that we were involved in. We also monitored motorcycle issues and were involved at Government Departmental level and lobbying in the background, setting the ground work, for the future. Generally it can be said that a motorcyclist’s lot is a happy one. Out on the road being observant and looking out for our own skin while interacting with other vehicles, however one observation that always crops up from riders is the use of mobile phones by other vehicle users. We could go on picking these campaigns and videos out from all over the world but what we want to see is actually how prevalent mobile phone and distracted vehicle user use is. If you want to help, then you can go to our “Mobile Phone Scourge – Mark It – Map It!” online map were you can add a “marker” if you have spotted a road user on their mobile phone talking or texting “illegally” or some other distraction so you can then gauge the ongoing scourge of mobile phone usage on the road. As motorcyclists we know that we are more susceptible to defective road surfaces. It’s not rocket science, poor road design and maintenance can contribute to motorcycle crashes, injuries, and fatalities. 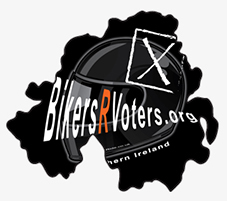 All Northern Irish motorcyclists have the right to clean roads! 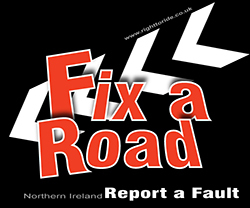 You can report a road fault to the Roads Services through their website. 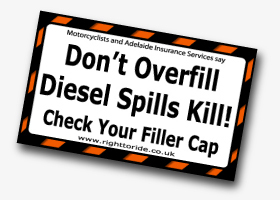 The spillage of diesel fuel from heavy commercial vehicles, vans and cars is particularly dangerous for riders. 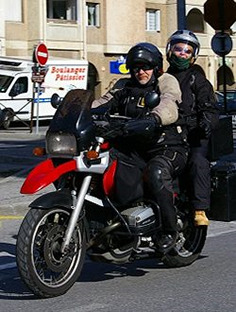 The result is a very slippery and invisible surface of which the motorcyclist has no warning and it almost inevitably results in the rider and machine parting company, often with serious consequences for the rider. October 2012 – Still On Going! Riders on the NI Bikers Forum have voiced concerns and are warning other riders of the hazard of new joints on the M3 Lagan Bridge in Belfast. 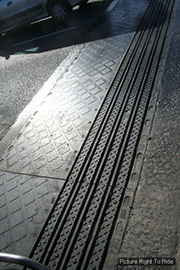 According to Roads Service the bridge joints where replaced during June and August in 2010 to ensure their continued high performance in coping with today’s traffic volumes. The latest communication that we have received from Roads Service, reiterates that they, the designers and the joint manufacturer are taking this issue very seriously and are actively pursuing this until its conclusion. 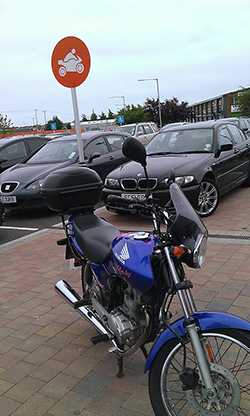 In November 2011 we reported about the new Sainsbury’s supermarket built in Bangor which had a dedicated motorcycle parking bay opposite the front doors of the new store. The simple solutions are sometimes the best and a few years later that simple solution was to place heavy duty advertising units at each end the bay – thus leaving room for motorcycles to enter and park in the bay, along with the cycle parking. We think that all round we can say we are happy with that! March 2011 – Force Feedback Throttle Withdrawn – Success! 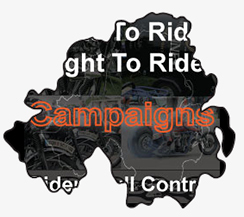 The SAFERIDER Project has ended and the “No To Throttle Control” campaign by Right To Ride to have the Consortium withdraw the Force Feedback Throttle was successful. The Consortium agreed to withdraw the device because it failed to prove to be a worthwhile product (although the pressure from riders and organisations such as FIM, must have influenced their decision). 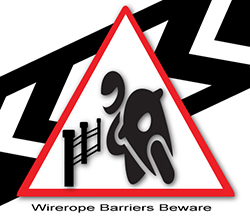 We reported that if the project consortium gets acceptance for the throttle control system – by default – because there is nobody to protest and nobody to challenge them, then what will stop the proposal of compulsory throttle control in the not too distant future? You can now join us on Facebook to support us against Throttle Control. Elections for the Northern Ireland Assembly and Councils took place on Thursday 5th May 2011. Our focus was on Road Safety – other vehicle drivers – the Roads Infrastructure (which should not make roads a dangerous place for motorcyclists) – the influence from EU legislation and the European Commission. Our main message was and still is that the motorcycle community in general is looking after itself and is involved, aware and are taking responsibility for its own safety. The next elections due are the European Parliamentary elections which are expected to be held in 2014. In June 2010 Northern Ireland MP Sammy Wilson was at it again, promoting the positive aspects of motorcycling in the UK Parliament. Sammy who is also a member of the Associate Parliamentary Group for Motorcycling has submitted an Early Day Motion (EDM) to the House of Commons. Find out how to get your MP to sign the EDM. 21st September 2009 – Still On Going! 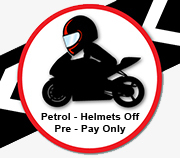 Following on from our successful petrol station campaign we are further raising the issue regarding removing helmets in petrol stations. What is the actual scale of the problem? Or is it just easy to adopt a policy of helmet removal without consideration of genuine honest law abiding customers who wear a motorcycle helmet. 26th March 2009- Successful Campaign! 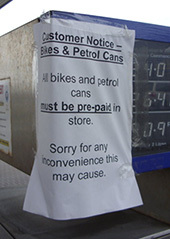 We have just had news through that the motorcycle discriminatory signs at the petrol station in Newtownards have been REMOVED! Before we got started it has all finished and a big thanks must go to Syd for highlighting the problem in the first place and Brian for his letter writing, both from the Lone Wolves Brotherhood.